Dinner at Lars and Karen’s house always begins the same way. 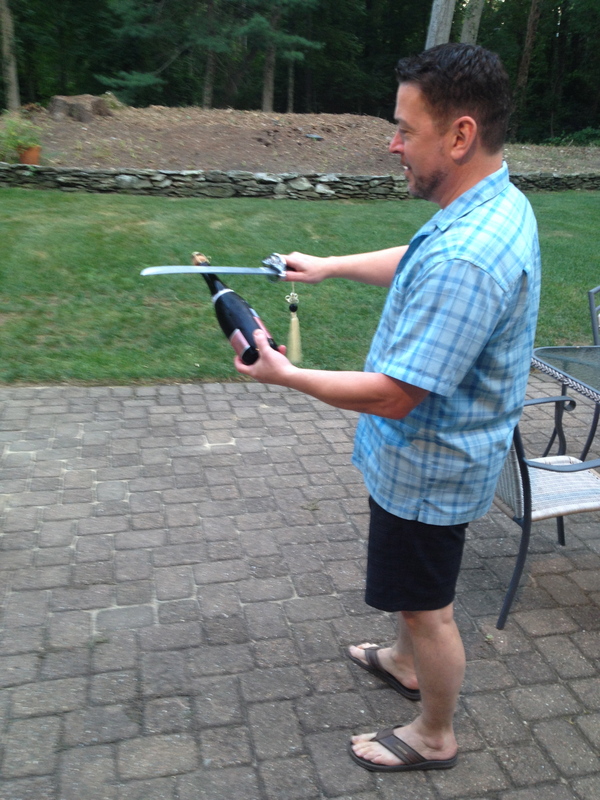 Lars takes a large silver sword from its box, holds a bottle of Cuvee Aurora Rose sparkling wine in his other hand, and with one fell swoop slices the cork and the top off the bottle. We watch in amazement while they fly across the yard. Lars Leicht is the head of the Cru Artisan division of Banfi. 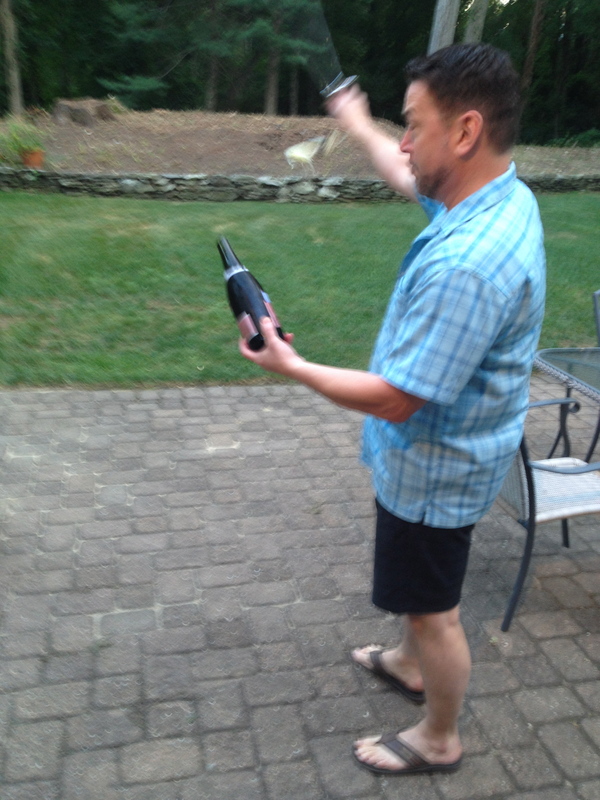 Here are the wines he served that night. He also did most of the cooking! 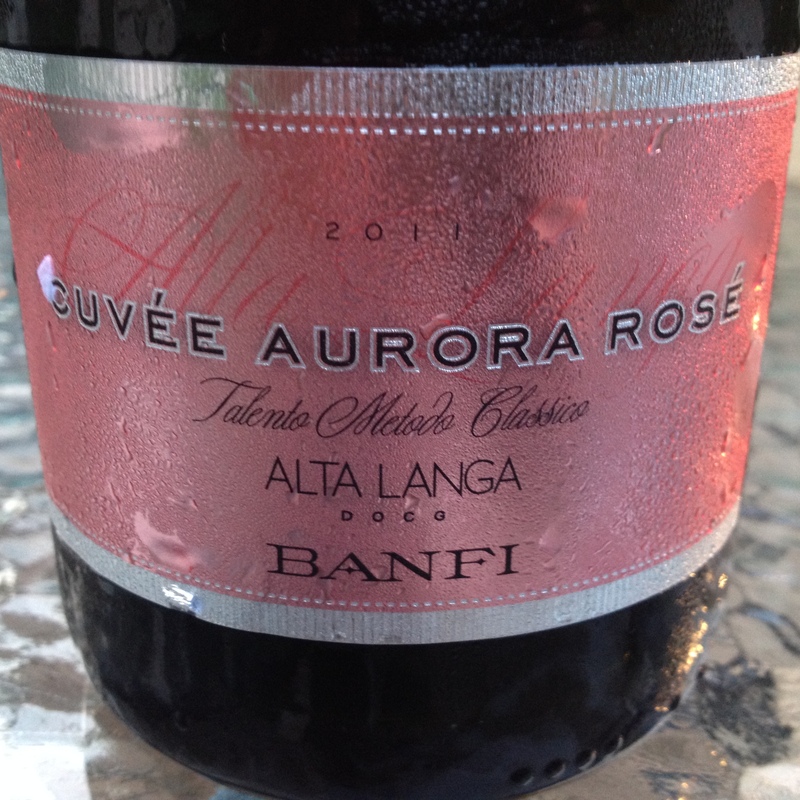 Cuvee Aurora Rose Alta Lange 2011 DOC 100% Pinot Noir Banfi Piemonte. The grapes are grown in the hilltop vineyards of the Alta Langa, south of Alba in Piemonte, in a mix of clay and calcareous soil. There is one hour of skin contact and cold maceration, which prepares the grapes for soft crushing. 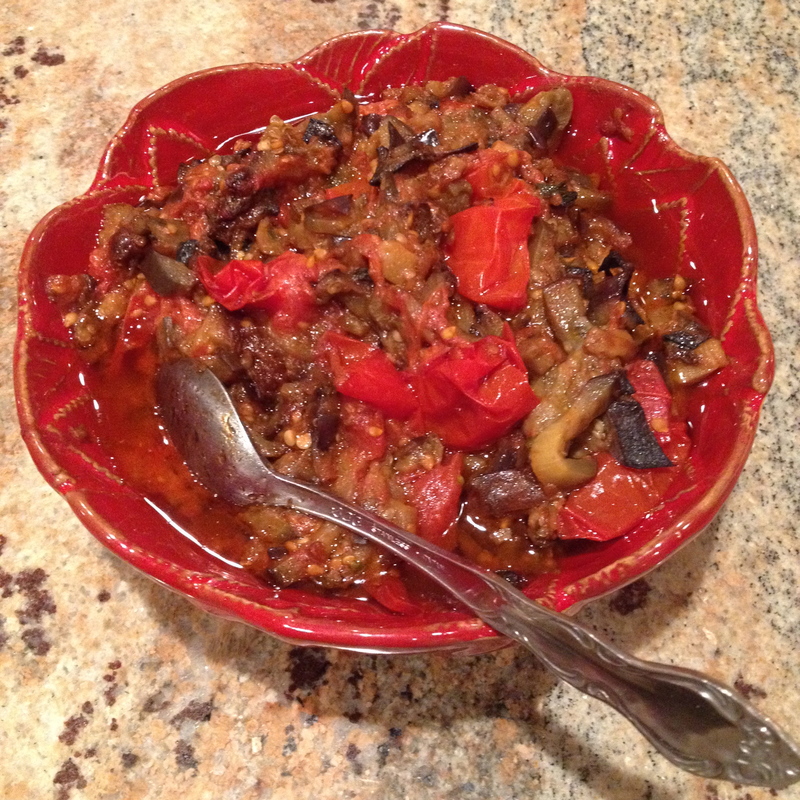 The must is clarified and fermentation is at a controlled temperature. The final cuvee consists of 90% clear wine and 10% of the previous vintage wine. The wine is aged in French oak barriques. Fermentation takes place in the bottle (Classic Method). Yeast contact is extended for at least 24 months followed by a traditional hand riddling (remuage) on pupitres and degorgement a la glace. A period of brief aging follows. The wine is pink in color, with small bubbles and hints of strawberry and apple. 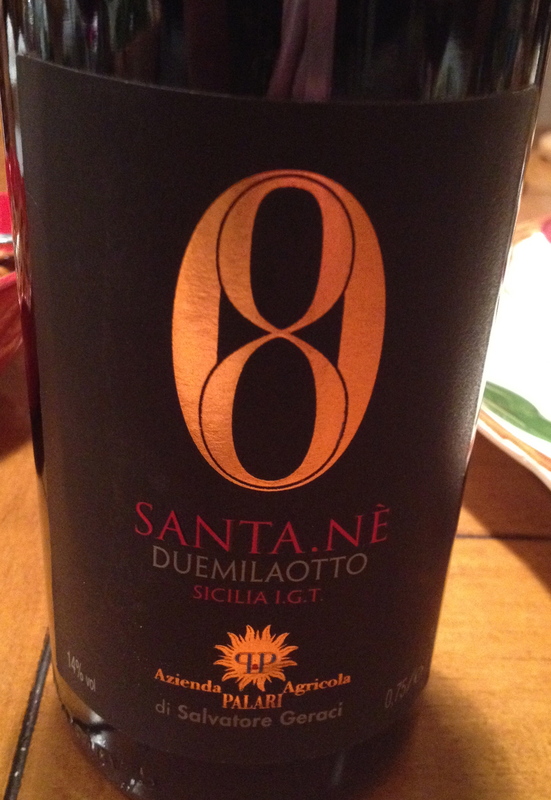 Lars served this wine with an assortment of appetizers including sauteed eggplant with cherry tomatoes, a Neapolitan dish. 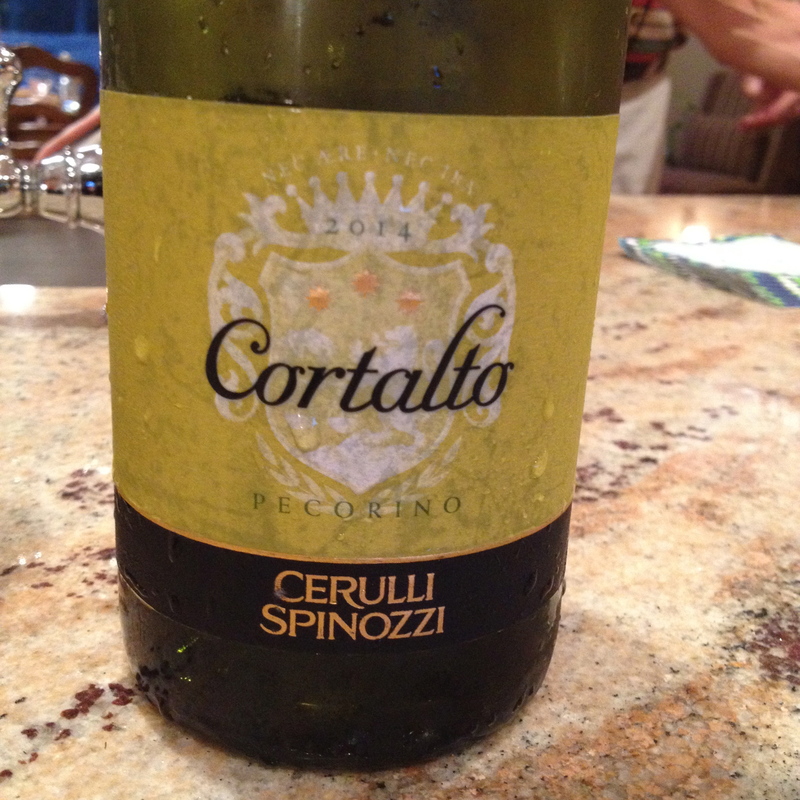 Pecorino “Cortalato” Colli Aprutini IGT 2014 100% Pecorino Cerulli Spinozzi. The vineyards are in the Colli Aprutini in Abruzzo. The soil is clay and sand. Fermentation is in stainless steel, prior to malolactic fermentation and it is aged on its lees fro 5 months prior to bottling. The wine has hints of citrus and peach with notes of apricot and orange and a touch of bitter almond on the lingering finish. I recommend this wine often and it is a true bargain at less than $18 a bottle. Enrico Cerulli has taken over the management Cerulli Spinozzi his ancestral property. I have met Enrico a number of times and am always impressed by his knowledge and passion for his wine. The consulting winemaker is Franco Bernabei, who I consider to be one of the best. 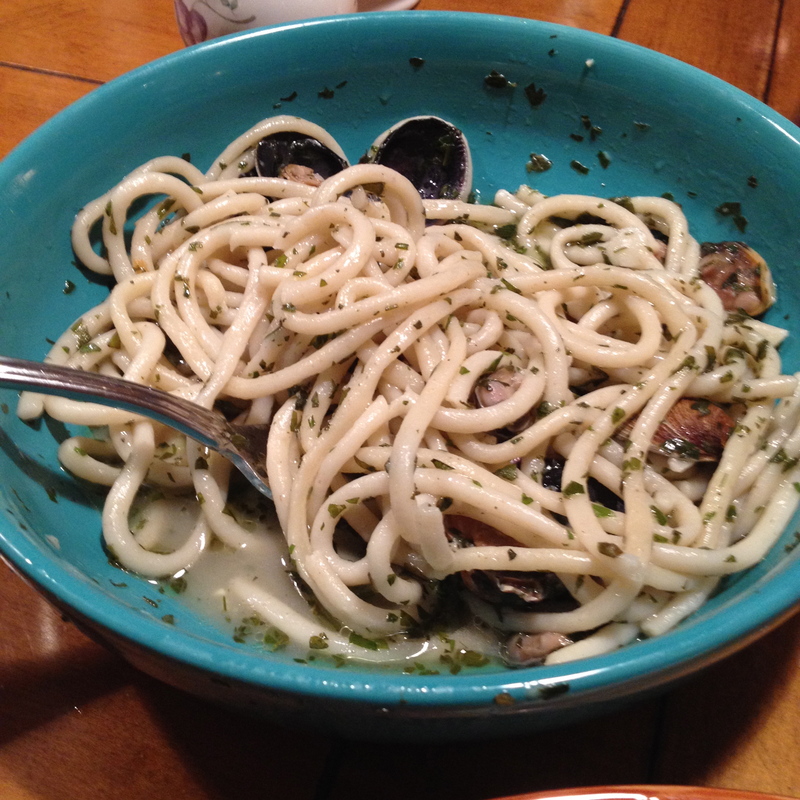 With it, we ate hand rolled pici pasta (like thick spaghetti) with clams and herbs. 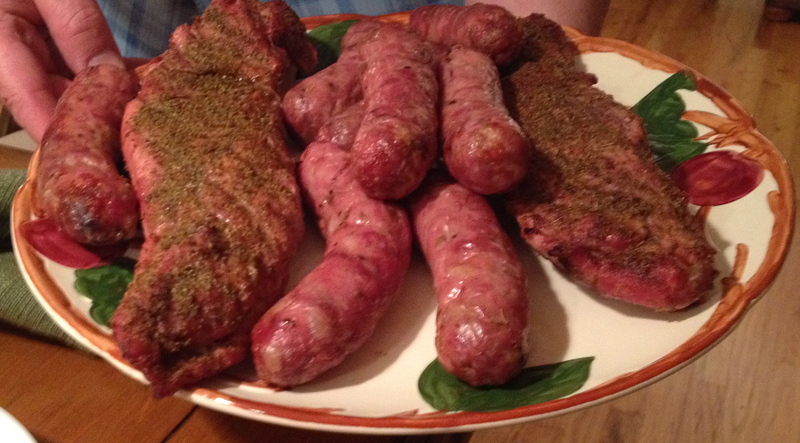 With the red wines, we ate an assortment of grilled sausages and lamb chops. 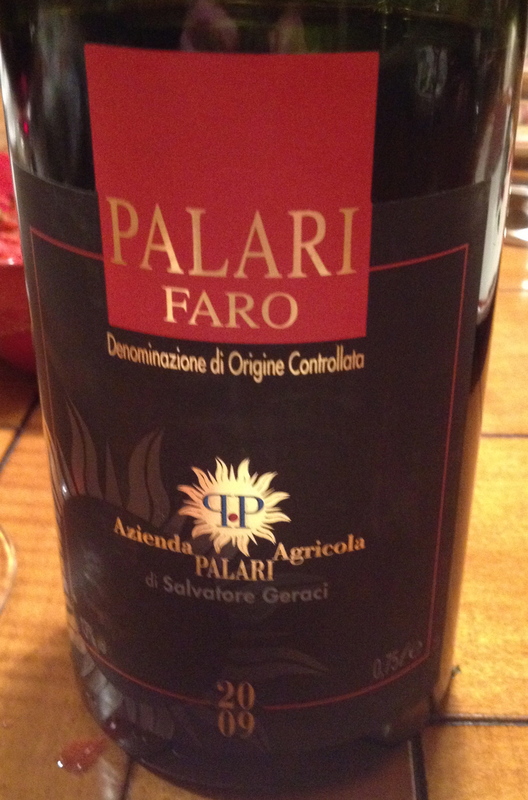 The next three red wines are from Palari owned by Salvatore Geraci. The grapes are grown in soil that consists of clay (argilla) in vineyards located in Santo Briga in Messina, Sicily. The wine is aged for 14 months in new barrels of Troncais oak. The wine is then bottled and allowed to rest, unfiltered for at least two more years before release. It has hints of tobacco, leather, red berries and a touch of spice. Rosso Del Soprano 2011 made from 60% Nerello, 15% Nocera, 20% Nerello Capuccio, 2% Acitana, 2% Jacche and 1% Coe’e Palumba. After a soft pressing and fermentation with native yeast in temperature controlled stainless steel, the wine ages in one-year-old barrels of Troncais and Allier oak. It is then bottled and rests, unfiltered, for about another year before release. 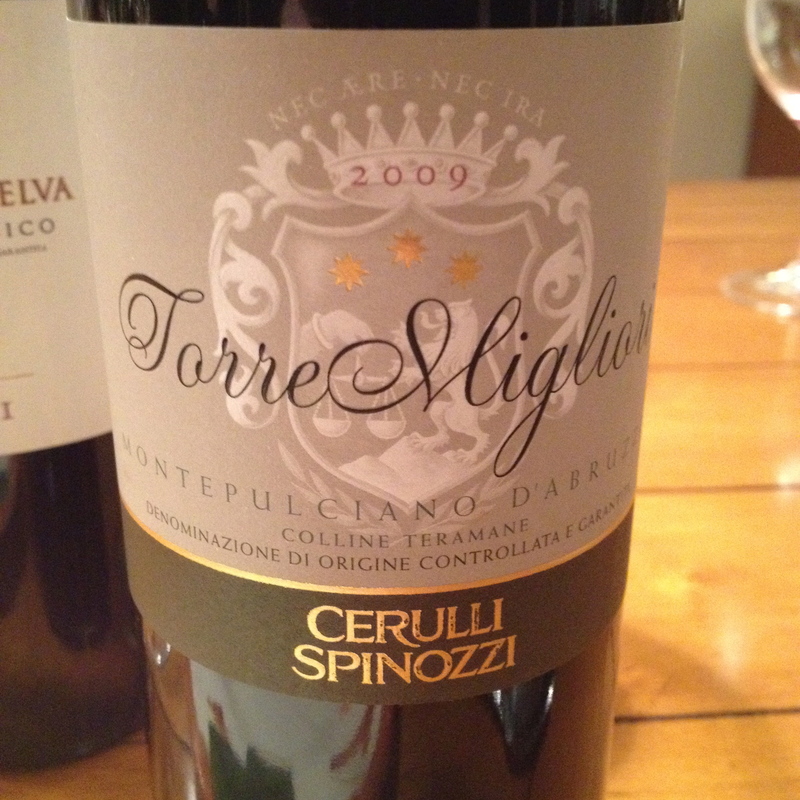 It has hints of ripe red berries and undertones of spice with a persistent finish. Faro 2009 Like the Rosso Del Soprano above, this wine is made from the same indigenous grapes but with a different selection. Salvatore Geraci the owner of Palari saved the Faro DOC from extinction by taking over the 6 hectare vineyard and producing the wine. The wine is aged in new barrels of Troncais and Allier oak for at least 12 months. The wine is then bottled and allowed to rest unfilited for an additional year before release. This is an elegant and complex wine with notes of ripe red fruit, spice and a touch of vanilla. It has a very long finish and pleasing aftertaste. Faro means lighthouse in Italian. 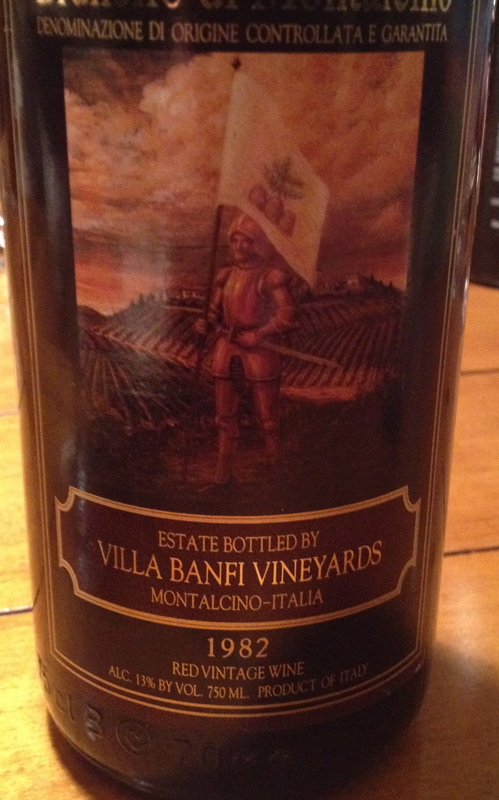 Brunello di Montalcino 1982 Villa Banfi 100% Sangiovese, select clones from estate vineyards on the southern hills of Montalcino. The grapes are grown in stony, calcareous and well-structured soil at an altitude of 720 ft. A careful grape selection is followed by vinification with skin contact for 10-12 days. The wines are released the 5th year after the harvest. Current vintages of this wine are aged a minimum of 4 years, 2 years in oak barrels of various sizes, mainly French oak barriques and partly in Slavonian oak casks. I do not believe the 1982 was aged in barriques and I do not believe the “clone selection” was the same back then. This is an elegant and complex wine with hints of red fruit, violets, and a touch of licorice and spice. It is showing no sign of age. A delightful Brunello. 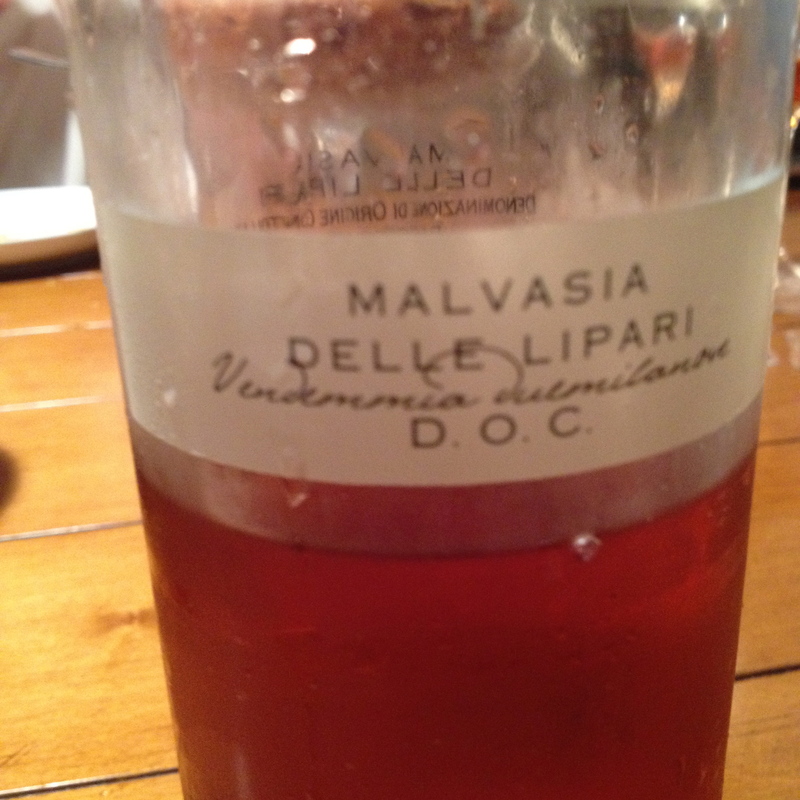 Malvasia Delle Lipari 2011 100% Malvasia, Florio. 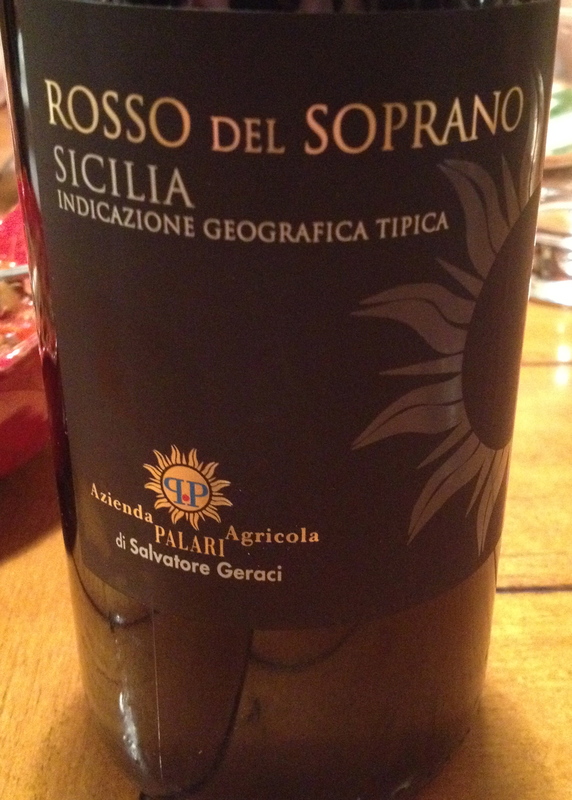 The wine is produced in Malfa, on the island of Salina, archipelago of the Aeolian Islands. The soil is of volcanic origin and sandy. The vineyards are planted on the coast less the 50 meters above sea level. The grapes are hand harvested then laid on reed mats to dry in the sun for about 20 days.